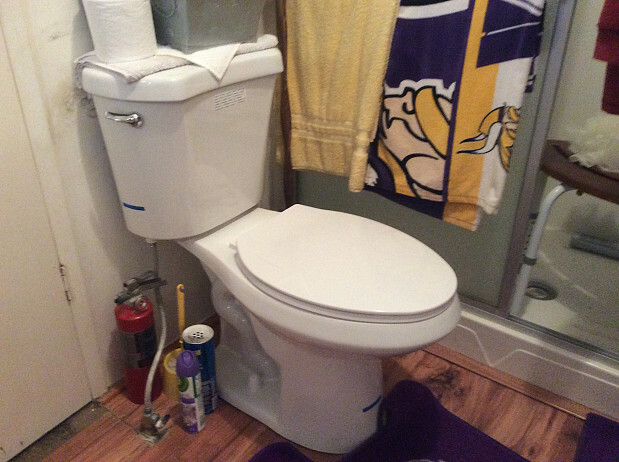 WHAT MY NETWORX CONTRACTOR DID FOR ME: Replaced 2 toilets; installed grab rails; made my bathrooms disable-accessible. WHY I CHOSE HIM: Pleasant and knowledgeable impression; fair price. The government just approved an important home improvement for me … making the 2 bathrooms in my house more accessible. You see, I’m disabled, and I requested a subsidy to install raised-seat toilets with grab rails next to them. Finally, the government agreed to cover part of the cost. To hire a contractor for the job, I first called Home Depot. They put me on some kind of list, but I didn’t hear back from them for a good 2 or 3 weeks. Eventually Networx put me in touch with Done Right Plumbing and Restoration. The team over at Done Right seemed to be very pleasant, which I liked. They were also very knowledgeable about what I had to have and gave me a rundown of everything. I didn’t ask for any other bids because I was so pleased with their good impression and the prices they quoted me. I knew how much the toilets and other equipment cost; as for the labor, I’d gotten a ballpark figure from Lowe’s, and this was right in the ballpark. So I decided to work with them. They sent out a technician, a very nice fellow named Tim, who did an excellent job. He lives near me in Sun Lake and he had a couple of other clients in the same area that day, which made it convenient for him. He brought all the equipment and put everything in, then came a second time to caulk it and make sure everything was tight. The grab bar and toilet installation took about 8 hours altogether, over 2 days. The icing on the cake was that he took away all the fixtures he’d pulled out, the boxes, and all the other trash. I liked his “clean as you go” attitude. In fact, Tim’s outstanding quality was his personality. He really knew what to say and what to do, and he explained thoroughly what he was doing. When I asked how long he’d been doing plumbing work, he told me he’d started in high school. He’s not quite 30 years old, but he’s already got 15 or 16 years in the business. Amazing! He likes the work, and he likes the company he works for. Now I have to take pictures and submit his bill to government to get reimbursed. It’s hard for me to do, because of my disability, but I’ll take care of it. Then you know how the government works; I’ll have to hurry up and wait. To choose a good plumber, I recommend that you talk to a few contractors, tell them what you want, and see if you like what you hear from them. Find out typical prices in advance, so you’ll know who’s giving you a reasonable bid. Make sure you’re communicating with someone who will understand your needs and your wants, and then make sure their service is within your price range. Check that he’s a licensed contractor, too, so that he can be held accountable and responsible. Done Right Plumbing ~Leak Detection~ Restoration Juan chavez: Very pleased with young man and his professional workmanship great job.